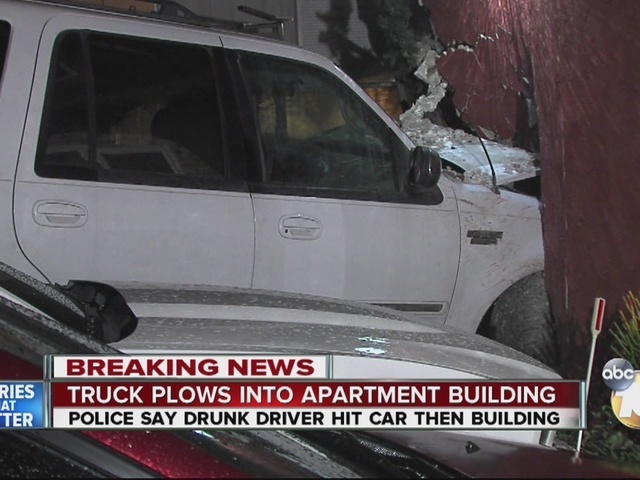 SAN DIEGO -- There were no serious injuries after a drunken driver slammed his SUV into an apartment building in University Heights Monday night, forcing residents from their homes. Just before 8 p.m., witnesses say the driver smashed into a car parked in the 4100 block of Texas Street, then fishtailed into the apartment building. The SUV went right through a first-floor kitchen. The people who reside in that unit were out of town at the time. Allison Seol was getting ready to go out to dinner when she heard the crash. She said the whole building shook. San Diego police report that no one in the building was hurt, and the driver was also not injured. He was initially taken to a hospital for evaluation before being arrested. His name was not released. "He seemed to be really drunk, like I know he wasn't able to walk a straight line and they were basically holding him up the entire time," Seol said. The building houses seven units. The bottom two were condemned until the city can inspect them, which could come Tuesday morning.